The Leuzinger High School Speech and Debate Team received a certificate of recognition at the Centinela Valley Union High School Board of Education meeting on March 8, 2016. This year, the Leuzinger High School Speech & Debate Team has amassed the most recognitions ever: six 1st place, seven 2nd place, four 3rd place, 12 "superior" certificates (4th-5th place) and 27 "excellence" certificates (6th-8th place). The total National Speech and Debate Association (NSDA) points as of Jan. 1, 2016 were 1,454 earned; their National ranking is 2,324 of 3151; their State ranking is 180 of 268. 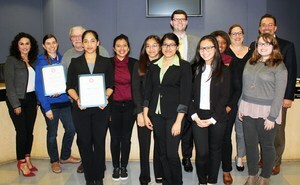 NSDA honored Leuzinger Speech and Debate as a Charter Member school with over 50 degrees awarded in a three-year period. Leuzinger is particularly proud of Onyeka Obi, who earned 1st place in House of Congress within the congressional debate arena.